What Can Blower Door Testing Do For Me? Air leakage on a home can have a significant impact on comfort, heating and cooling costs and maintenance. 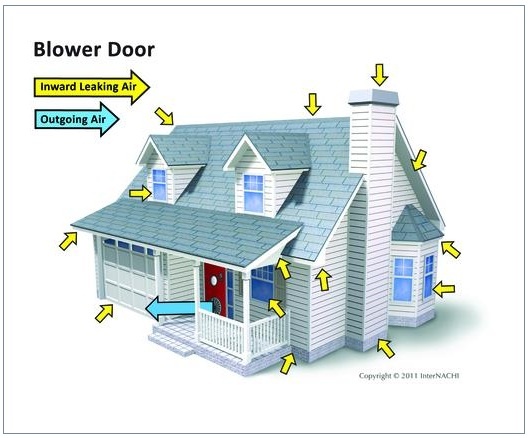 North Arkansas Electric Cooperative offers blower door testing to members who are curious if there are ways to improve the energy efficiency of their home. 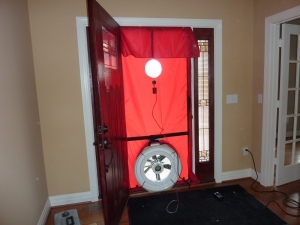 A blower door test helps identify where leaks are in a home and how leaky the house is. Tests using the blower door enable members to assess the “tightness” of their home eliminating the guesswork regarding leakage and air tightness. The system consists of a powerful, variable-speed fan with a speed controller mounted in an adjustable panel that is temporarily fit into an open exterior doorway. A set of manometers or differential pressure gauges are used to measure pressure differences generated by the fan. Airflow across a calibrated opening in the fan housing is also measured. When operating, the blower door fan acts as an exhaust fan and vents indoor air to the outside. This vacuuming action causes the air pressure in the house to drop below the pressure of the air outside. Detecting air leakage into the conditioned space is a simple matter of feeling for leaks around openings such as window trim, can lights, or heat registers, to name just a few. How Can I Get A Blower Door Test Done On My Home? North Arkansas Electric Cooperative provides this testing to NAEC members. The cost of the testing is $100 no matter the square footage of the home. The energy advisor(s) conducting the test will provide a list of recommendations on how to improve the tightness of the home.